Thomas Woodrow Wilson ( December 28, 1856 – February 3, 1924) was the 28th President of the United States. A devout Presbyterian and leading intellectual of the Progressive Era, he served as president of Princeton University then became the reform governor of New Jersey in 1910. With Theodore Roosevelt and William Howard Taft dividing the Republican vote, Wilson was elected President as a Democrat in 1912. He proved highly successful in leading a Democratic Congress to pass major legislation including the Federal Reserve System, the Federal Trade Commission, the Clayton Antitrust Act, the Underwood Tariff and the Federal Farm Loan Act. Re-elected in 1916, his second term centered on World War I. He tried to negotiate a peace in Europe but when Germany began unrestricted submarine warfare against American shipping he called on Congress to declare war. Ignoring military affairs, he focused on diplomacy and finance. On the home front he began the first effective draft in 1917, raised billions through liberty loans, imposed an income tax on the wealthy, set up the War Industries Board, promoted labor union growth, supervised agriculture and food production through the Lever act, took over control of the railroads, and suppressed left-wing anti-war movements. He paid surprisingly little attention to military affairs, but provided the funding and food supplies that made Allied victory in 1918 possible. He went to Paris in 1919 to create the League of Nations and shape the Treaty of Versailles. Wilson collapsed with a debilitating stroke in 1919, as the homefront saw massive strikes and race riots, and wartime prosperity turn into postwar depression. He refused to compromise with the Republicans who controlled Congress after 1918, so the Senate failed to ratify the Versailles Treaty. It went into effect anyway, but the U.S. never joined the League of Nations. The consensus of presidential experts ranks him in the first or second tier of best presidents, in a 1982 poll it ranked him sixth out of thirty six presidents, and in a 2000 poll it ranked him sixth again out of forty one presidents. Thomas Woodrow Wilson was born in Staunton, Virginia in 1856 as the third of four children to Reverend Dr. Joseph Ruggles Wilson (1822–1903) and Janet Mary Woodrow (1830–1888). His ancestry was Scots-Irish. His grandparents immigrated to the United States from Strabane, County Tyrone, in modern-day Northern Ireland. Wilson's father was originally from Ohio where his grandfather had been an abolitionist and his uncles were Republicans. But his parents moved South in 1851 and identified with the Confederacy. They kept slaves and set up a Sunday school for them. They cared for wounded soldiers at their church. The father also briefly served as a Confederate army chaplain. Wilson’s father was one of the founders of the Southern Presbyterian Church PCUS after it split from the northern Presbyterians in 1861. Joseph R. Wilson served as the first permanent clerk of the southern church’s General Assembly, was Stated Clerk from 1865-1898 and was Moderator of the PCUS General Assembly in 1879. Wilson spent the majority of his childhood, to age 14, in Augusta, Georgia, where his father was minister of the First Presbyterian Church. During Reconstruction he lived in the South Carolina state capital Columbia, South Carolina from 1870-1874, where his father was professor at the Presbyterian Theological Seminary. Wilson did not learn to read until he was about 12 years old. His difficulty reading may have indicated dyslexia or A.D.D., but as a teenager he taught himself shorthand to compensate and was able to achieve academically through determination and self-discipline. He studied at home under his father's guidance and took classes in a small school in Augusta. In 1873 he began studies at Davidson College in North Carolina, but stayed only for one year. He transferred to Princeton as a freshman, graduating in 1879. Beginning in his second year, he read the Federalist Papers, J. R. Green, Macaulay, Burke, John Bright, and Bagehot. He wrote an article for the Nassau Lit on Bismarck; and won a prize for an essay on William Pitt, 1st Earl of Chatham. He was active in the undergraduate discussion club, and organized a separate Liberal Debating Society. In 1879, Wilson attended law school at University of Virginia for one year but he never graduated. He later continued his studies while living at home in Wilmington, North Carolina. "As an adult, Wilson was a man of above-average height and weight, standing around six feet four inches tall. From age eight, he wore eyeglasses, including pince nez glasses as an adult. He had black eyes and pale white hair." Wilson seemed to think that he was often in poorer health than he really was. However, he did suffer from hyper-tension at a relatively early age and may have suffered his first stroke at age 39. He bicycled regularly, including several bicycling vacations in the British lake district. In January 1882, Wilson decided to start his first law practice in Atlanta. One of Wilson’s University of Virginia classmates, Edward Ireland Renick, invited Wilson to join his new law practice as partner. Wilson joined him there in May 1882. He passed the Georgia Bar in October 1882 in a performance rated as “not short of brilliant” by the presiding judge. - However, Renick and Wilson was a short-lived firm. With few cases to keep him occupied, Wilson quickly grew bored and disillusioned. Moreover, Wilson had studied law in order to eventually enter politics, but he discovered that he could not continue his study of government and simultaneously continue the reading of law necessary to stay proficient. In April 1883, Wilson applied to the new Johns Hopkins University to study for his Ph.D. and, in July 1883, Wilson left his law practice to begin his academic career. Wilson started Congressional Government, his best known political work, as an argument for a parliamentary system, but Wilson was impressed by Grover Cleveland, and Congressional Government emerged as a critical description of America's system, with frequent negative comparisons to Westminster. Wilson himself claimed, "I am pointing out facts—diagnosing, not prescribing, remedies.". By the time Wilson finished Congressional Government, Grover Cleveland was President, and Wilson had his faith in the United States government restored. When William Jennings Bryan captured the Democratic nomination from Cleveland's supporters in 1896, however, Wilson refused to stand by the ticket. Instead, he cast his ballot for John M. Palmer, the presidential candidate of the National Democratic Party (United States), or Gold Democrats, a short-lived party that supported a gold standard, low tariffs, and limited government. 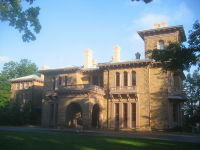 Prospect House, located in the centre of Princeton's campus, was Wilson's residence during his term as president of the university. In 1906-10, he attempted to curtail the influence of the elitist "social clubs" by moving the students into colleges. This was met with resistance from many alumni. Wilson felt that to compromise "would be to temporize with evil.". Even more damaging was his confrontation with Andrew Fleming West, Dean of the graduate school, and West's ally, former President Grover Cleveland, a trustee. Wilson wanted to integrate the proposed graduate building into the same area with the undergraduate colleges; West wanted them separated. West outmaneuvered Wilson and the trustees rejected Wilson's plan for colleges in 1908, and then endorsed West's plans in 1909. The national press covered the confrontation as a battle of the elites (West) versus democracy (Wilson). Wilson, after considering resignation, decided to take up invitations to move into New Jersey state politics. - In 1910, Wilson was elected governor of New Jersey, and served in this office until becoming President in 1913. Wilson experienced early success by implementing his "New Freedom" pledges of antitrust modification, tariff revision, and reform in banking and currency matters. Wilson experienced early success by implementing his " New Freedom" pledges of antitrust modification, tariff revision, and reform in banking and currency matters. Historians agree that, "The Federal Reserve Act was the most important legislation of the Wilson era and one of the most important pieces of legislation in the history of the United States." 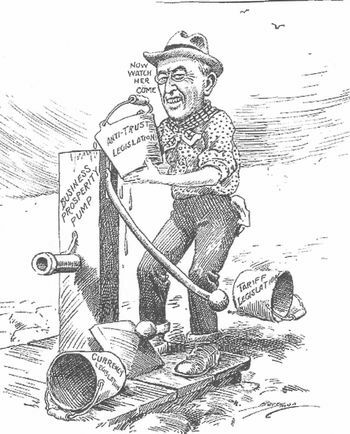 Wilson had to outmaneuver bankers and enemies of banks, North and South, Democrats and Republicans to secure passage of the Federal Reserve system in late 1913. [Link 1954 pp 43-53; Link 1956 pp 199-240] He took a plan that had been designed by conservative Republicans—led by Nelson W. Aldrich and banker Paul M. Warburg—and passed it. However, Wilson had to find a middle ground between those who supported the Aldrich Plan and those who opposed it, including the powerful agrarian wing of the party, led by William Jennings Bryan, which strenuously denounced banks and Wall Street. They wanted a government-owned central bank which could print paper money whenever Congress wanted. 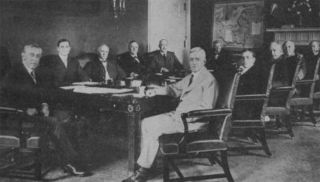 Wilson’s plan still allowed the large banks to have important influence, but Wilson went beyond the Aldrich plan and created a central board made up of persons appointed by the President and approved by Congress who would outnumber the board members who were bankers. Moreover, Wilson convinced Bryan’s supporters that because Federal Reserve notes were obligations of the government, the plan fit their demands. Wilson’s plan also decentralized the Federal Reserve system into 12 districts. This was designed to weaken the influence of the powerful New York banks, a key demand of Bryan’s allies in the South and West. This decentralization was a key factor in winning the support of Congressman Carter Glass (D-VA) although he objected to making paper currency a federal obligation. Glass was one of the leaders of the currency reformers in the US House and without his support, any plan was doomed to fail. The final plan passed, in December 1913, despite opposition by bankers, who felt it gave too much control to Washington, and by some reformers, who felt it allowed bankers to maintain too much power. In 1913, the Underwood tariff lowered the tariff. The revenue thereby lost was replaced by a new federal income tax (authorized by the 16th Amendment, which had been sponsored by the Republicans). The "Seaman's Act" of 1915 improved working conditions for merchant sailors. As response to the RMS Titanic disaster, it also required all ships to be retrofitted with lifeboats. Ironically, although in the long term the lifeboat provision would save lives, it may have contributed to the " Eastland" disaster in which the top-heavy cruise ship capsized and sank in Chicago—killing over 800 tourists. Wilson broke with the "big-lawsuit" tradition of his predecessors Taft and Roosevelt as " Trustbusters", finding a new approach to encouraging competition through the Federal Trade Commission, which stopped "unfair" trade practices. In addition, he pushed through Congress the Clayton Antitrust Act making certain business practices illegal (such as price discrimination, agreements forbidding retailers from handling other companies’ products, and directorates and agreements to control other companies). The power of this legislation was greater than previous anti-trust laws, because individual officers of corporations could be held responsible if their companies violated the laws. More importantly, the new laws set out clear guidelines that corporations could follow, a dramatic improvement over the previous uncertainties. This law was considered the "Magna Carta" of labor by Samuel Gompers because it ended union liability antitrust laws. In 1916, under threat of a national railroad strike, he approved legislation that increased wages and cut working hours of railroad employees; there was no strike. Until Wilson announced his support for the suffrage amendment, a group of women calling themselves the Silent Sentinels protested in front of the White House, holding banners such as "Mr. President—What will you do for woman suffrage?" |} law, it also resulted in civilian deaths. The final result was exceptionally close and the result was in doubt for several days. When the early results came in on the evening of election day, it looked as if Hughes would win and both candidates went to bed believing that Wilson had lost. The vote came down to several close states. Wilson won California by 3,773 votes out of almost a million votes cast and New Hampshire by 54 votes. Hughes won Minnesota by 393 votes out of over 358,000. In the final count, Wilson had 277 electoral votes vs. Hughes 254. 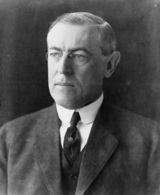 Wilson was able to win reelection in 1916 by picking up many votes that had gone to Teddy Roosevelt or Eugene V. Debs in 1912. When Germany resumed unrestricted submarine warfare in early 1917 and made a clumsy attempt to enlist Mexico as an ally (see Zimmermann Telegram), Wilson took America into World War I as a war "to make the world safe for democracy." He did not sign a formal alliance with Great Britain or France but operated as an "Associated" power. He raised a massive army through conscription and gave command to General John J. Pershing, allowing Pershing a free hand as to tactics, strategy and even diplomacy. To stop defeatism at home, Wilson pushed the Espionage Act of 1917 and the Sedition Act of 1918 through Congress to suppress anti-British, pro-German, or anti-war opinions. He welcomed socialists who supported the war, such as Walter Lippmann, but would not tolerate those who tried to impede the war or worse, assassinate government officials, and pushed for deportation of foreign-born radicals. His wartime policies were strongly pro-labor, though again, he had no love for radical unions like the Industrial Workers of the World. The American Federation of Labor and other 'moderate' unions saw enormous growth in membership and wages during Wilson's administration. There was no rationing, so consumer prices soared. As income taxes increased, white-collar workers suffered. Appeals to buy war bonds were highly successful, however. Bonds had the result of shifting the cost of the war to the affluent 1920s. After Russia left the war in 1917 following the Bolshevik Revolution and started providing help to the Germans, the Allies sent troops to prevent a German or Bolshevik takeover of allied-provided weapons, munitions and other supplies which had been previously shipped as aid to the Czarist government. Wilson sent expeditionary forces to assist the withdrawal of Czech exiles along the Trans-Siberian Railway, hold key port cities at Arkangel and Vladivostok, and safeguard supplies sent to the Tsarist forces. Though not sent to engage the bolsheviks, the U.S. forces did have several clashes with them. Wilson withdrew the soldiers on April 1, 1920, though some remained as late as 1922. As Davis and Trani conclude, "Wilson, Lansing, and Colby helped lay the foundations for the later Cold War and policy of containment. There was no military confrontation, armed standoff, or arms race. Yet, certain basics were there: suspicion, mutual misunderstandings, dislike, fear, ideological hostility, and diplomatic isolation....Each side was driven by ideology, by capitalism versus communism. Each country sought to reconstruct the world. When the world resisted, pressure could be used." On January 9, 1918, after years of lobbying and public demonstrations by the women's suffrage movement (including a 5000 woman march which had preceded his 1913 inaugural parade down Pennsylvania Avenue, nearly causing a riot), Wilson finally announced his support of the 19th amendment guaranteeing women the right to vote. The next day, the House of Representatives narrowly passed the amendment but the Senate refused to even debate it until October. When the Senate voted on the amendment in October, it failed by two votes. In response, the National Women's Party and other suffrage organizations effectively urged male citizens to vote against anti-suffrage senators up for election in the fall of 1918. After the 1918 election, most members of Congress were pro-suffrage. 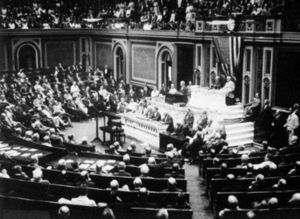 On May 21, 1919, the House of Representatives passed the amendment by a vote of 304 to 89, and 2 weeks later on June 4, the Senate finally followed, where the amendment passed 56 to 25. It was ratified on August 18, 1920, upon its ratification by Tennessee, the thirty-sixth state to do so. Secretary of State Bainbridge Colby certified the ratification on August 26, 1920. On February 27, 1922, a challenge to the 19th Amendment was rebuffed by the Supreme Court of the United States in Leser v. Garnett. While president of Princeton University, Wilson discouraged blacks from even applying for admission. Princeton would not admit its first black student until the 1940s. In 1921, Wilson and his wife retired from the White House to a home in the Embassy Row section of Washington, D.C. Wilson continued going for daily drives and attended Keith's vaudeville theatre on Saturday nights. Wilson died in his S Street home on February 3, 1924. 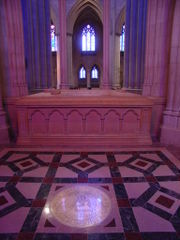 He was buried in Washington National Cathedral. Mrs. Wilson stayed in the home another 37 years, dying on December 28, 1961. Mrs. Wilson left the home to the National Trust for Historic Preservation to be made into a museum honoring her husband. Woodrow Wilson House opened as a museum in 1964. Wilson was an early automobile enthusiast, and he took daily rides while he was President. His favorite car was a 1919 Pierce-Arrow. On his last birthday in 1923, he was given a new Rolls Royce Silver Shadow as a gift by friends from Princeton. Wilson was an avid fan of the New York Giants and Washington Senators baseball clubs. Wilson (born in Virginia and raised in Georgia) was the first president from any state that had joined the Confederate States of America to be elected since 1848 (Zachary Taylor, born in Virginia), and the first from there to take office since 1865 (Andrew Johnson born in North Carolina). Wilson was also the first Democrat elected to the presidency since Grover Cleveland in 1892. The next Democrat elected was FDR. 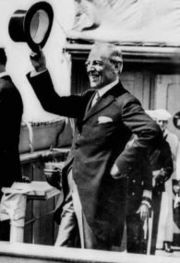 Wilson was the first President to speak on national radio although he did so in November 1923, after having left office. Wilson appeared on the now-out of print (but still technically legal tender) $100,000 bill The bill was used only to transfer money between Federal Reserve banks. Wilson was president of the American Political Science Association from 1910 to 1911. In Harry Turtledove's " Great War" trilogy of alternate history novels, Wilson is elected 9th President of the Confederate States of America on the Whig ticket in 1910.